NYPD Commissioner James O’Neill always says he loves cyclists — but for the second time this week, his rank-and-file officers have indicated that they do not. The latest example comes courtesy of the 107th Precinct in Kew Gardens Hills, which posted a tweet on Thursday urging cyclists to “bike smart” — but included a graphic that shows every other road user acting dumb (including a cop on the beat!). The pedestrian is crossing against the light and does not appear to be paying attention. A yellow cab is illegally parked in what appears to be a two-way bike path (because of its width). The driver of the yellow cab is opening his door into a cyclist, which is illegal. The cab has forced another cyclist out of the bike lane and into traffic. Another cyclist is getting a ticket from an officer, even though the graphic suggests that the cyclist had the light (after all, the pedestrian was crossing against the light). The caption reads, “Bike smart. Be visible, use bike lanes and remember to give pedestrians priority.” Nothing in the picture suggests that cyclists were not prioritizing pedestrians. But everything in the picture suggests that no one needs to prioritize cyclists. 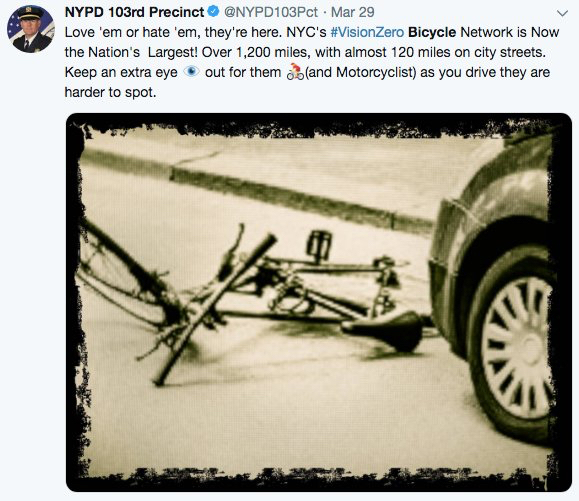 Earlier in the week, O’Neill was forced to admit that a tweet from the 103rd Precinct, also in car-centric Queens, sent the “wrong message.” That tweet featured a picture of a crumbled bicycle that had apparently been run over by a car. The caption on the horrific photo urged drivers to keep an eye out for cyclists — “love ’em or hate ’em.” The social media posting was later replaced with something less offensive. This tweet was deleted after it enraged city cyclists. File a take down notice Thrillist! The police officer has a big gut, so they got that right at least. The photo makes a lot more sense in the context of the Thrillist article. Too bad the tweet didn’t include it. Legalize Throttle Electric Bikes ?! !